Simple. Lack of preparation and continuous organization. Last weekend on my latest camping trip I found myself spending the majority of my time cleaning, and cooking, and trying to find everything. It was an unorganized, chaotic mess. Nothing would stay put, everything was disheveled, and I was NOT enjoying myself. I still love hiking, and waterfalls, and nature. But the lack of organization took up so much of my time that I wasn’t able to enjoy the parts of camping that made it worth it. I was putting the last cooler in the back of my SUV and It hit me. I’m not used to being the ones to organize the trip, the site, and the camping kitchen. I didn’t have all of the necessary equipment. Frankly, I was an unorganized mess throughout the entire weekend. I started racking the internet to find THE BEST organizational tips and tricks for camping, so that I can enjoy my unplugged and back to nature time. One of the first things that I found was that I had no idea what I was supposed to bring. Yeah, a tent, a sleeping bag, and my caffeine fix. Other than that, I found myself lacking on the details. 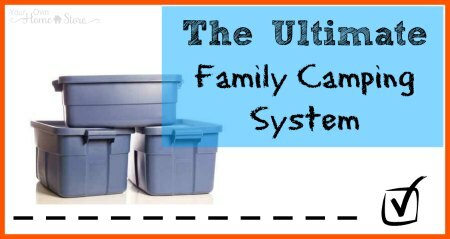 This blog lays out EVERYTHING that you could possibly need, how to keep it all together, and how to maximize time with your family. I have these checklists all printed out and I’m going shopping TO.MOR.ROW! Read more of Courtni’s best camping hacks here! Recreational Equipment, Inc (REI) is a coop that supports conservation efforts and loves its members. I have found them to have INVALUABLE advice for camping equipment, safety, and just some really amazing tips and tricks. The BEST one that I found for this purpose though, was this one. I TOTALLY forgot about lighting my tent. That’s like one of the first things that this blog touches on. By the way, they also have some really cool classes that might be in your area! And here I thought that hot dog sticks, a grill, and a cooler would be fine. Let. Me. Tell. You. It very much wasn’t. Active.com gives us some A-MAZ-ING tips and tricks on how to organize a kitchen, what you need, and even some exquisite campfire recipes. Here's EVERYTHING you need to Design and Organize an Easy and Practical Camp Kitchen from Beyond the Tent (ya know, just ANOTHER KILLER resource for camping). Okay, for real, don’t judge on this one. There are no wifi hook-up suggestions, and no ways to stream your favorite Hulu shows. This is about comfort. This was a huge problem that I faced on my last camping trip. Like, I cannot sleep on hard surfaces like that anymore. I just can’t. If I can be more comfortable in my tent, I am 100% convinced that I will be better rested and ready to explore the next day. Angie also has some amazing tips on Organizing a Camping Kitchen. So, if you like what she did inside the tent, make sure to check out what she did for the kitchen! One Last Thing...Remember to secure EVERYTHING! I cannot tell you guys how often I misplaced something just because it fell off the table, and the time that was wasted trying to find it. But, I was lucky enough to grab some VersaBands for the BBQ yesterday. These lil guys made sure the cups stayed on the cooler, the table cloths stayed put, and I could even put napkins under them. VersaBands are super durable and sooo crazy versatile. Feel free to check out the gallery to see what else you can do! Are there any tips that YOU swear by? Please, please, please let me know on Instagram or Facebook! I’m looking forward to going again reallly soon!